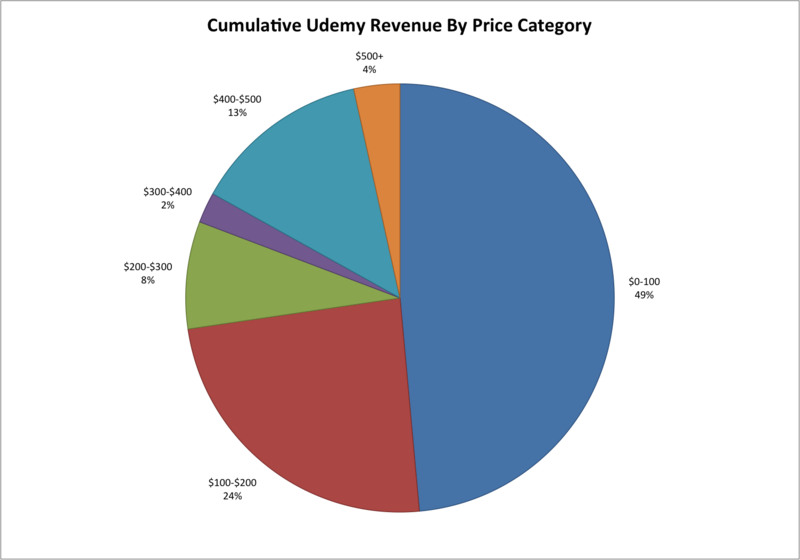 My recent annual analysis of Udemy data has yielded interesting results. In short, Udemy is deliberately diversifying its content portfolio and breaking dependencies on particular course providers. 1. Udemy is no longer overly dependent on just one course provider. In January 2014 close to 50% of their cumulative revenues came from a single company in Canada: Infinite Skills. Our November 2014 data shows that Udemy saw that risk very clearly, and worked hard to diversify its course portfolio. This effort seems to have born fruit: 50% of the company’s cumulative revenues now comes from 27 providers. As this diversification took place in the past twelve months, it seems that Udemy’s content managers and the marketing team are making a deliberate effort to break away from dependence on Infinite Skills. 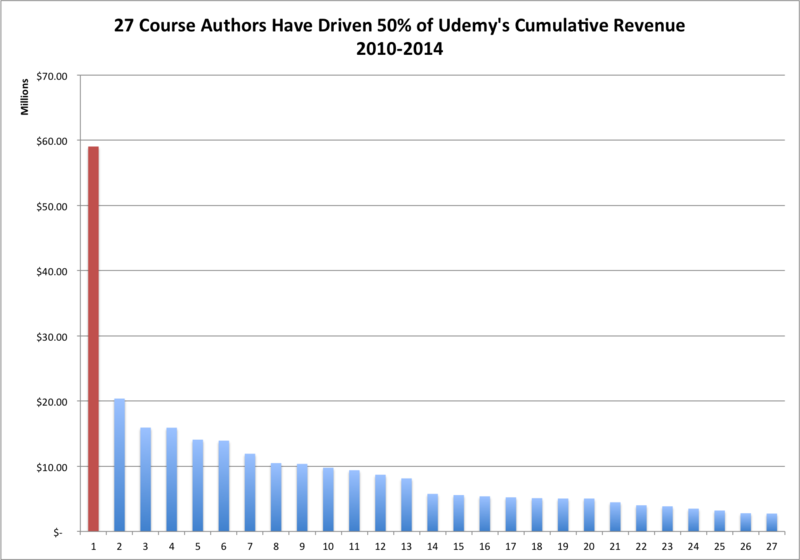 In November 2014, 27 course providers were responsible for 50% of Udemy’s revenues. 2. Udemy is no longer an Excel training company it used to be twelve months ago. Back in January this year, seven out of ten top courses by enrollment and revenue on Udemy were about Excel. Although Microsoft Excel courses are still VERY important in Udemy’s portfolio, the company has made a successful shift into Software development and Business categories. The new course providers that Udemy has managed to bring in generate quite a bit of revenue in areas of marketing and mobile app development. 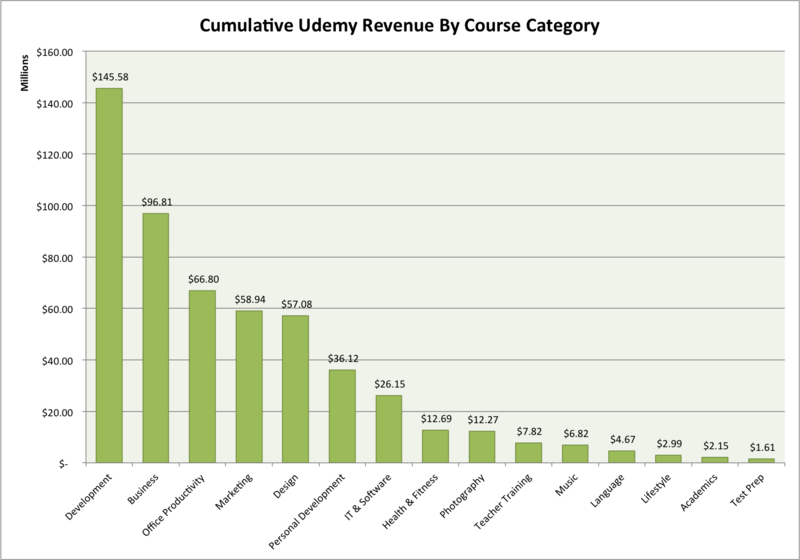 Software development and business dominate Udemy’s portfolio in terms of revenue. 3. 10% of enrollments drive 50% of cumulative revenues. Udemy remains in a tough spot in terms of pricing and market positioning, although this seems to be changing, albeit slowly. In the online education and training world, I place Udemy in “basic office skills and basic technology skills” content category where brand of course provider does not matter as much as the quality of content they produce. Based on our data, in 90% of cases Udemy’s value proposition is “commoditized knowledge at bargain prices”. 50% of cumulative revenue to date comes from 90% of all enrollments within the “$1-$100″ price range. What’s amazing is that the other half of revenues to date has come from just 10% of all paid course enrollments that come from all other price segments ranging from $101 to $5000 per enrollment. Obviously, this is a completely different market segment and it is a least just as important for Udemy as its most popular price segment. Udemy’s difficulty next year would be in managing its polarized user base. If you need access to our database, please sign up to my live seminar: I will be doing a live review of Udemy data on January 15, 2015 at 12:00PM PST on Rukuku. During the event, I will present my findings and analysis of online trainig trends that can be glimplsed from comparing 2013 and 2014 data. When you sign up, you will have access to the full raw database that contains most up-to-date information on Udemy’s courses, user and revenue growth, pricing strategies, etc. After the live event, you will also have access to Udemy January 2013 data as well as my analysis of changes that took place. This entry was posted in edtech, Mobile education technology, online courses, teaching online, Technology in education by Denis Zaff. Bookmark the permalink. Yes, their cumulative revenue to date can be $500M, but given the deep discounts that they run the cumulative revenue figure to date is probably lower. hey, can you share the sources for your information? Hi Namisha, our only source is Udemy.com – all the information is there. For me Udemy can market your course very well, but when It comes to the revenue commission, it’s not fair. This COURSE https://www.udemy.com/make-money-teaching-online/?couponCode=earn100 taught me how I can build my own website, redirect clients from udemy to my website and earn 100% revenue share by offering a lower price! I come from Viet Nam. Now, I launch th startup Edumall.vn, that like the Udemy in Viet Nam. I know you research about Udemy. This is so interesting! Are you planning to post an update based on the past year or so? I’ll be so interested in seeing how Udemy, its revenues and it’s course creators have evolved.